Firstly, our sincere thanks go to everyone who braved the chilly morning to farewell us at the Fisherman’s Hall in Port Denison on Saturday 3rd July. After some last minute checks at Geraldton we continued our journey north to Steep Point and the official start of our trek. Our first overnight camp was at Galena Bridge where we shared the area with many holiday makers setting out for the July school holidays. Day 2 saw us break camp at about 8.45am and finally feel as though we were really on our way. Morning tea break was taken at the 200 mile tank, with our lunch break being at the Billabong Roadhouse. 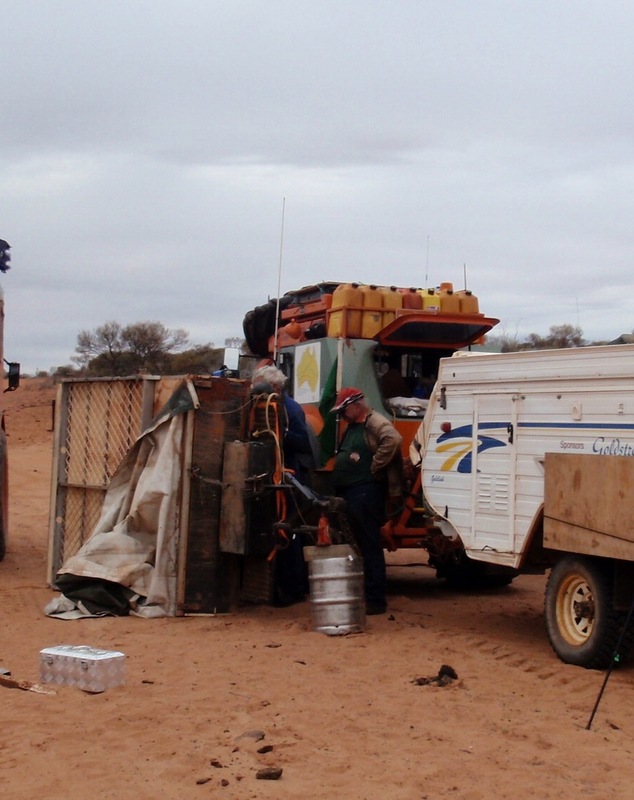 Our evening campsite was at the Overlander Roadhouse. Once everyone had set up for the evening, welding repairs were under way for Harry whose trailer required a spot of welding. 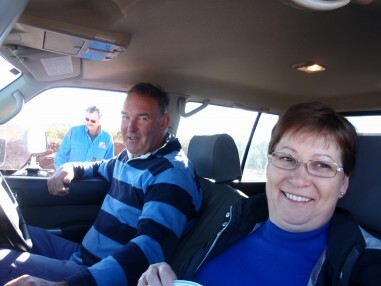 At about 4.30pm we had a great surprise (especially to those of us who were on the original 2000 trek) when Kim and Susan Henderson arrived at our camp site on their way back from a week’s holiday in Exmouth. An earlier text from Susan had determined where we were but none of us had any idea that they were about to join us. Susan is remembered by members not only for her great entertainment qualities both musically and with her bright, bubbly personality but also as Secretary and a major co-ordinator of the 2000 trek. A great evening of fun and laughter was had by all around the camp fire. At the beginning of day 3 repairs continued on Harry’s trailer then Anne & Noeline were given a fairy induction by Chief Fairy Susan (again many past trekkers would relate to this side of Susan)! With trailer repairs completed and farewells made to Kim and Susan we finally headed west where our travelling day ended at Tamala Station camping area right on the beach. Unlike the year 2000, we were not able to take the tractors right out to Steep Point this time – all part of changing times! None of us could complain about the campsite offered though, we all made the most of the Indian Ocean views being well aware that it would be a long run before we would enjoy the views of the Pacific Ocean. 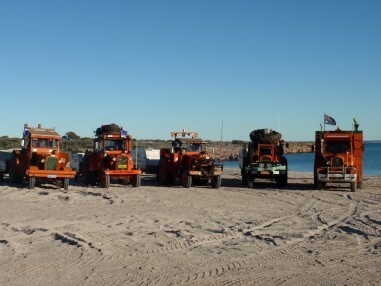 On day 4 some of the group made the trip out to Steep Point in the support vehicles whilst those who had been there in the year 2000 stayed in and around the campsite. Day 5 after returning to the Overlander, where refuelling etc was carried out we were again on our way finally turning in to Byro-Woodleigh Road and heading east at last. 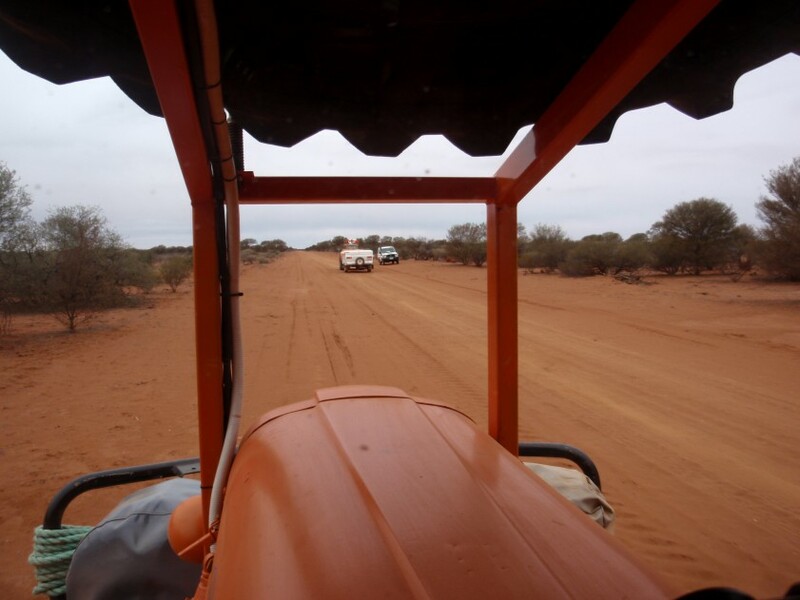 We did approximately 200km’s for the day before setting up a bush camp near Yalardi Station. Day 6 we awoke to overcast conditions with warnings of rain on the way. During the day more welding was required on the trailer but we still made good travelling time to have a scheduled meeting with two reporters from the West Australian Newspaper who wanted to do a photo shoot and interview about our adventure. We then made our way to Beringarra Homestead – home of Simon and Natalie Broad – where we set up camp for what was to be our first wet night. For the Broad’s we were all aware of how important any rain was so of course there were no complaints from the trekkers. These people in this sort of country are to be admired especially seeing how the red dirt and dust quickly changes to sticky red mud!! 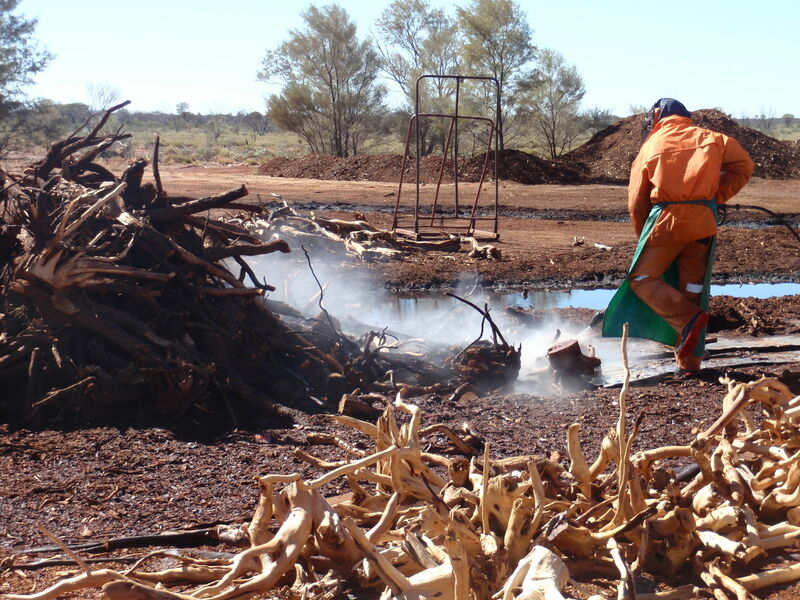 Packing up on day 7 was not so pleasant but we were soon on our way heading towards Mt Gould and on through to Meekatharra. When we commenced the day we were travelling in rain and mud then before Meekatharra we travelled through a sand (not dust) storm. 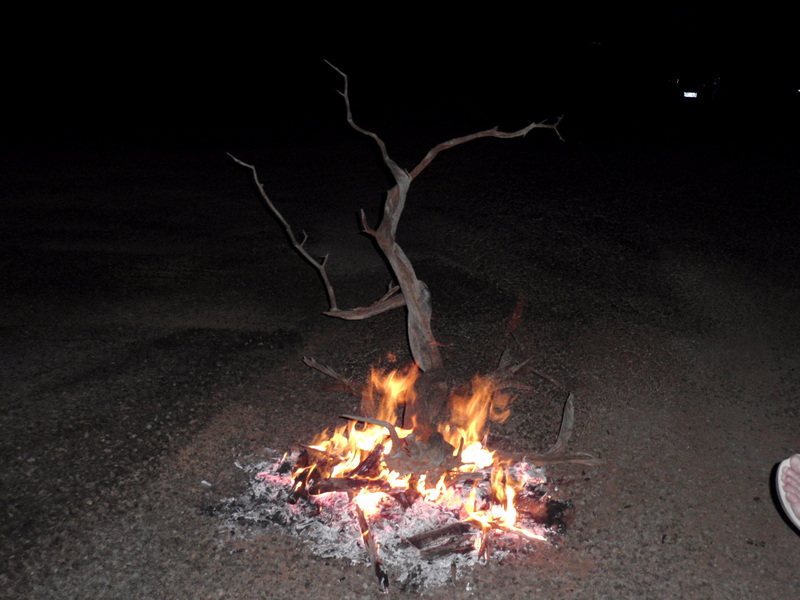 On arrival into Meekatharra we certainly looked as though we had been travelling in the outback. 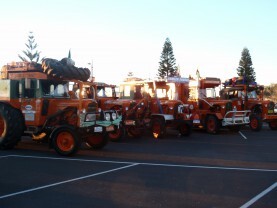 Gone were the shiny rigs that left Dongara on day one!! Once we were parked up at the local caravan park it was decided that any requirements in the way of repairs or re-stocking would be carried out the following morning before we departed the town. An evening meal at the Commercial Hotel sounded like the go for four of us – most enjoyable at that. An added pleasure to us (the Bass’s) was catching up with Kate (formerly employed at the Shire of Irwin offices) and Marty (Police Officer) who are now happily based at Meekatharra.